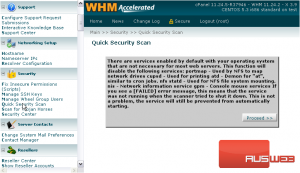 WHM allows you to run two security-related scans that may be of use to you. 2) Start with Quick Security Scan. This tool will check for and disable any unnecessary services that may have been installed by your operating system. If they aren’t being used, there’s no point in keeping them running. 3) Click Proceed to begin the scan. Any [FAILED] results from the scan indicate that the service wasn’t running, so there was nothing to shut down. 4) Next, let’s Scan for Trojan Horses. A Trojan Horse is a type of malicious software that may appear harmless but actually can allow a hacker to gain access your system. 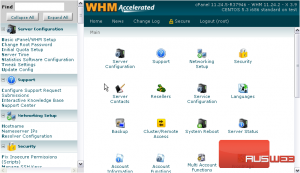 This function will check for system files that have recently been modified by something other than cPanel or the operating system. Generally, this tool only finds false positives and not trojan horses. 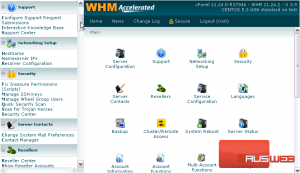 There are better alternatives, but none that come with WHM. Still, you might want to look into any files that this scan points out, to ensure that they have not been compromised. 5) Proceed with the scan. As you can see, the scan detected 16 possible trojans — that doesn’t mean that they definitely are trojans. In fact, it’s more likely that they aren’t. This tutorial is now complete. 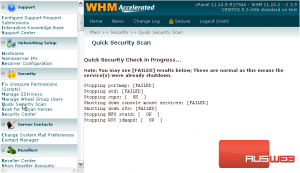 You now know how to run security scans in WHM.